It's been a week of my favourites and if you're still around, thanks for indulging me! When I was telling my son about all my posts, he said "mum, you're using the word MY a lot there. Maybe you should do a kids' favourites..." Today's favourite isn't just mine- it's my kids' too. Our Christmas tree. We don't have a themed tree or a designer tree or even a colour scheme. We have a collected tree- little snaps of moments in time. When we were kids, decorating the tree was something we looked forward to for weeks. My parents are real tree people (you can't beat it) so we didn't get the tree up until into December. My mom would make appetizers and dad would pull out the Mickey Mouse record player and put on the Kenny and Dolly record (I just downloaded this on iTunes, it's my favourite and I don't care). Mom and dad would put up the lights- coloured with a couple of strings of white thrown in. Then mom would put on the beaded garlands. Then it was our turn. We would sift through the boxes and find our favourites. Ones we made, ones we received as gifts, and ones we just liked best. After awhile, my brother and I would peter out and my mom would be left to finish it up. And then when she was done, we would just lay on the living room floor and soak in the magic. Our tree decorating isn't so intentional. It's a little more haywire, like I am. When the urge hits us, I go get the totes and away we go. We don't have a real tree for two reasons. First is my husband cannot deal with the mess- I've tried convincing him how great it is and he's not buying it. Second, I like to decorate early. I'm not apologizing for it, it makes me happy to have those twinkly lights going mid November and no real tree is lasting that long, it would be one sad tree by Christmas morning if I tried. 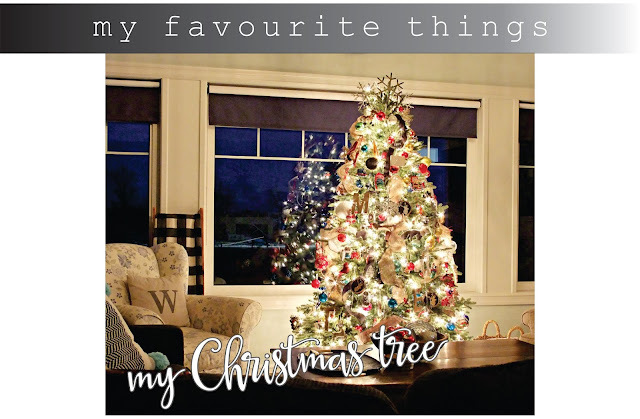 Our tree is from Canadian Tire- and I really couldn't be happier with it. It's a couple years old, but it's very similar to the Canvas Pre-Lit Ashby Spruce tree It looks pretty real, it's pre-lit and super easy to put together. We have white lights on our tree- my kids would prefer coloured. I've put coloured lights on our old tree and I love it too- however, I don't feel like I see the ornaments as well with coloured lights, and my ornaments bring the colour to the party. B. collect copious amounts of hair from said animals. In my collection of random stuff, I have an old aqua coloured crate- and the tree fits perfectly. The sides of the crate go up a little higher too, so you don't see that sad, skinny post that artificial trees have. And you can vacuum all around it. Bonus for the neat freak husband. As I said, we don't have a colour scheme for our tree. We have ALL the colours. they add so much colour and shine. I also have a bunch of different ornaments that I have made over the years. The wood slices, the NOEL tag and the German glass glitter initials (we each have one). And, of course, ones my kids made. This one is one of my favourites. My son made it for my husband last year. He thought dad needed an ornament of something he liked. Hint, it wasn't Star Wars. And yes, that is just a cut out piece of paper perched in my tree. I wouldn't change it for the world. Of course, the ones that speak to our kids. Elsa- cause ELSA- and the Timbit snowman for my son when he was 2 and ate Timbits like they were going out of style. A good old satin ball! It's the Disney gang and it's my birth year and I found it at a yard sale. Can you say meant to be? This is one of my favourites, no one is allowed to unwrap it, hang it or even touch it but me. Tim's aunt gave this to us in 2010, the year our daughter was born. Aunt Catherine always got us a special ornament each year- but this one, I don't know what it is that gets me about it. This isn't a typical Laura pick. Catherine passed away in the spring of 2014 and it broke all of our hearts. I picked up this cardinal that Christmas and the kids and I say it's to remind us of her. And that makes me happy. Topping our tree this year is a cluster of snowflakes. It's not perfect, but it's perfectly me. My tree has a messy bun too. There are three of the sparkly twiggy ones, and then the simple metal cut out, all just stuck into the top of the tree on a whim. I think this is my favourite tree topper. Ever.